On a recent "Inside the Actor's Studio," Micheal J. Fox was being interviewed. He had a pretty funny comment about why he didn't like math. Why I can't quite remember the exact quote, it went something along these lines. "Two plus two equals four. That's it. There's nothing else to it. No matter who adds them up, it's always the same. It's been solved." And then he went on about how acting let's him explore new things, and how his interpretation of a character is going to be different than someone elses. Math is always the same. The ability to play around with new, unique things is a fun part of design (and more than often, can be rough). At one point I was more than happy to try and design games around a certain mechanic or theme that I had seen in another game, just to muck around with it. Isla Margarita is a good example of this. I had seen the game called Bridges of Shangri La, and decided that I wanted to try my hand at a connect-things-with-bridges game. Then I mixed in a little of Puerto Rico-styled select-your-action game play. It still might feel new because of the changes I've made as the design went along, but I don't feel like there's anything TRULY unique about the game. I've progressed beyond that now. Now I want to try and create new systems along with new games. While the final product may not exhibit any truly unique requirements from the outside viewer, a lot of my design process now is spent on trying to derive things that are entirely new. Minsterpool reflects this. While it might feel like another typical political/area influence game, I really wanted to try and make a game in which characters and relationships died over time, and in that regard, the players also had some amount of control over the speed of their deaths. I'm not sure how much a player gets from this initial design challenge; hopefully, it feels new and fresh because of this. But it's also somewhat abstracted out to "just playing an action card." Vegas Showdown is a game that is fairly interesting in this respect. Here's a game that gets really good ratings, yet also gets seemingly punished for borrowing too many elements from other games. First of all, while some of the elements might seem borrowed, there's plenty of differences. Most notably is the "lay out your rooms" mechanic, possibly borrowed from Prince of Florence. Aside from the basic description of placing tiles in a confined space, the actual usage feels completely different to me. Princes had all these weird odd-ball shapes that you had to contend with; made especially harder if you didn't bother buying up builders, which lessened various spacing requirements. It really was Tetris on a board. Vegas is different; it's more about connecting rooms appropriately, and placing certain tiles next to each other. Princes didn't care what was next to each other, just as long as you fit them in your little world. Granted, the auctions are somewhat similar, but that's pretty much the way all auction games work. Overall Princes was more about building all this machinery to play your scoring cards; Vegas is a little more "pure" in the room layout respect; it's all about how you place tiles on your board, and how they connect. They are both strong games that share some similar aspects, but not enough similarity for me to complain. While I love Princes, there's a huge amount of headaches in that game, regarding things like the evergrowing minimum point value for creating a work of art and the shopping list of stuff you must be continually adding up. Vegas is happily streamlined. Anyway, as I've said, I've tried to move on to trying to develop mechanics as uniqie as possible now. Since Comcast has put the halt on Restless for the time being, I'm now setting my sights on doing another solitaire project based on the Leviathan discussion at BGDF. This has been rattling in my brains for some time, and I've sort of parsed the game down into a few distinct mechanics that I'm trying to approach with new ideas. Most notably, I've been trying to come up with a new way to resolve combat. No dice throwing, no charts of comparison numbers, etc. 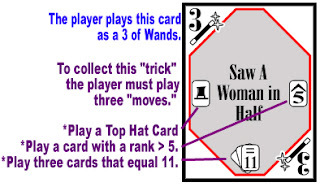 Yet something relatively simple and doable under the auspice of a solitaire game. And I think I've finally come up with something that I'm currently mocking up to test. This is definitely going to be a fairly unique approach to handling battles (at least in my mind). As the discussion in the BGDF thread boiled down, the goal of the game should be mostly about spreading the tales of terror of the terrible monster (you) that has attacked the ships, so the real goal of the game is to create Tale points at various ports around the Atlantic Ocean. However, as ports grow wise of the terrible creature out at sea, fleets from those ports will start to include warships to battle the monster below; large amounts of fame and famous monster hunters will start joining in the chase. As a side note, I want the monster to "evolve" as the game goes. But the monster will evolve somewhat randomly, based on the ships the player has taken down previously. The Evolution system will take place, at least in my initial thinking, as a set of captain's logs, telling tales of the horrible beast. Fun flavor text that will hopefully create a nice little story that changes with each play. I think that I'm going to borrow somewhat from the Betrayal at the House on the Hill mechanic of determining the Haunts in the game. So those are my three major systems I'm looking at: Battle, Tales, and Evolution. And they need to intertwine. And I think I've got all the pieces in my head. There are obviously many lower level systems at work, as in any game. These include things like player movement, determining the ship types in an area of the ocean, etc. So, after setting up a bunch of Restless test pages and trying to upload them to my Comcast webspace, things don't work. It turns out that Comcast only allows a few Front Page server-sde includes, as oppopsed to using typical internet standard stuff. Sweet Comcastic suckfest. Well, I finally managed to update PocketCiv with the new "scalable event" Event cards and rules. Sadly, this completely breaks the walkthrough scenarios; I'm not sure if I want to go through that pain again (which is the right thing to do) or just blow them off and forever remove them from the server. I just don't have the time to update those with my other plans for my short hobby hours. And I've finally caught up posting all of my scans for My Budding Artist, my blog for my 3.5 year old daughter and some of her drawings. I thought this would be interesting to track her progression from completely random scribbles to, well, less random scribbles. However, if she keeps up her interest in drawing stuff, it might actually have a real nice progression over many years. And I'm starting to fall behind on the scans again...sigh. Finally, my whole priority list has changed again in terms of design projects. Once again, I'm going forward with Restless, only because I now have a pretty solid foundation for how I want to test it out. Restless started out originally as a complicated "choose your own adventure book" kind of thing. You move pawns around on a map, you looked up a chart that cross-referenced what turn it was with where you were, which then got you to a list of book entries which you had to choose from based on how many players were in that room. Those entries were FURTHER expanded to other entries based on various player stats. It became quite the headache to keep this entry chart staight with all these cross-referenced numbers, affectionately called "the database." This has been an off again/on again project for a few years now, I've had about 30 "beats," or major elements to the story outlined out. Not to mention my various false starts with it. At one point, I've gotten about 40% through the game over a few months, took a break, then came back to it,and had no idea where to continue it from. It's a game that really needs a strong focus to wrap one's head around the creation of, apparently. Mostly, due to where I was in the database, and how far I had gotten on the various story threads, things got quickly off-track. Well, some friends of mine have been big on goofy "tear away a page caladars" recently, where each day gives you a new factoid, or questions to answer. Which got me to thinking that this might be a way to go with Restless by make each turn calandar based. But it still had a lot of database issues regarding entry numbers and such. I've just changed the mechanism for what a turn is. But then I got to thinking about trying to create a weblog game [edited to nando's liking, and the correct terminology], where each day you could go to a blog, and then get your instructions, or game state changes. Html becomes a perfect replacement for the database. Sure you need to keep your links straight, but I don't have to deal with hundreds and hundreds of entry numbers scattered around in a book. Also, the blog format lets the people I know who I chat with everyday on IRC play together (well, I hope they try it out), without having to create physical books for everyone. Anyway, I'm currently building this, getting my feet wet in terms of formatting room descriptions and such. I'll probably turn it on after I've got 8 or 10 turns linked up, just to see how feasible the game is, and then determine if I want to continue it from there. Anyway, I've got a starting point now, and a pretty good direction. You can check out the eventual home page here (now with rules!). Now that the holidays are over, I'm starting to catch up on a lot of things; hopefully I can get back to designing things soon. One of the things that has slowed me down is the "art game" known as Exquisite Corpse. Basically, someone draws a 460X200 pixel image, sends it in, and then the Corpse Engine sends out the bottom 15 pixels of that image to the next artist, who must continue the picture only with the information provided in that little 15 pixel strip. And then, he turns in his 200 pixel high image, and the process repeats. It plays very much like an online party game. Which, makes sense since it pretty much is an old party game. Aside from the occasionally amusing and/or shocking reveal of the entire image at the end when all the absurdities come to light, it is a rather simple exploration of the collective unconscious. This basically states that there is a shared psychology amongst all humans in all cultures. A part of the game is trying to understand what the previous artist was doing given only that 15 pixel sliver of information, as the best Corpses seem to be the ones that carry a similiar theme through each artists' panels. Therefore, there is some sense that all of the artists shared a common psychology on a particular piece. Recent examples that seemed to fall into place like this would be this one (regarding theme) and this one (regarding color usage). Of course, you get the opposite results more frequently. Especially with some artists who don't quite get the concept of trying to match the seams with the previous players. And even still, this image comes across as a sort of cool, movie poster image. And looking at a group of these pictures in an archive format is pretty dazzling, with all the crazy uses of color and images and just general looniness. Anyway, my most pressing game design goals right now are to get the updated PocketCiv rules and Event cards done, followed by finishing a prototype of the newly-named Lumina Dark (I've got a half-baked rule set stsuck in my head). Finally, I really, REALLY want to work on a Leviathan themed solo game next, spurred on by this BGDF discussion. Man, that's a lot of links up there. YAY! for hypertext.